Follow the instructions below to sign in to your Interfolio account the credentials of a partner institution. 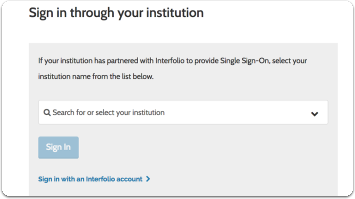 Note: If your institution is not partnered with Interfolio or if you are not currently added to an institution's Interfolio account, then this login method will not work. Navigate to the sign in page via www.interfolio.com and select: "Sign In"
There are a number of ways to get to the sign in page; from our home page interfolio.com (exampled above), a search engine, etc. 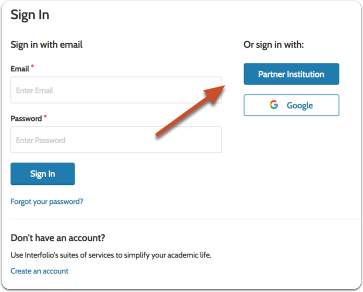 If you are unable to login via SSO or a partner institution, then you should get in contact with your point of contact at your institution to make sure you have been added to their Interfolio user accounts, or call Scholar Services at (877) 997-8807 and we can take a look.